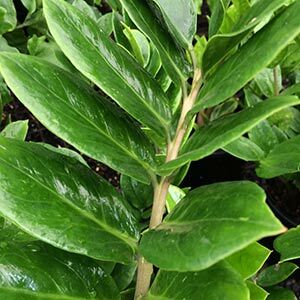 The ZZ, plant widely sold as an indoor plant, commonly called the Zanzibar Gem Plant, the botanical name is Zamioculcas zamiifolia. This is a tough indoor plant widely used in commercial buildings as well as favorite in many homes, available for sale from indoor plant specialists. This is a slow growing plant with foliage similar to Zamia furfuracea, however these are a very different plant. Why is this plant so tough and why does it grow so well indoors inflow light, with little water ? This little plant that resembles a cross between a fern and a cycad grows naturally in dry shaded areas, the only way you can kill it is to over water it or let it get to cold. Originally from eastern Africa, it is grown as a tropical foliage plant. Zanzibar Gem works well as indoor plant cooler areas and grows well in pots or containers. The sap of the plant is toxic, so keep cats away from the plant as they do have a tendency to eat green things at times. If it actually gets to dry, and that has to be a severe drought it simply goes underground and reappears when it gets a little moisture. Indirect or filtered light is required, as is a free draining potting mix, try a potting mix that is free draining similar to an orchid mix. A little slow release fertilizer once or twice a year or a foliar fertilizer. Use a pot that is not to large as larger pots can end up providing to much moisture. Divide and repot when the plant becomes to big. Propagation by division simply involves cutting the rhizome into 2 or 3 and replanting. Best grown in a container in all but tropical climates. Use a free draining succulent potting mix. Strong filtered light is best, deep shade will slow down growth. Regarded as drought tolerant once established. Many problems with Zamioculcas zamiifolia are related to over watering. Fertilize in spring and again in summer with a slow release type fertilizer. Reduce watering to zero in winter. Keep temperature at 14C or above at all times of the year.